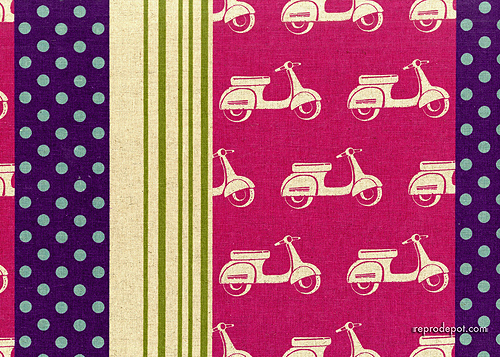 New Scooter Fabric from Repro Depot and Super Buzzy! Thanks to Emily R. for this find. And also to Kick-Draw McGraw Becky M. who pointed out there were two other colors available than I didn’t know about. Reprodepot.com has some fantastic fabrics (kitties hiding in boxes and bags anyone?) and now they have one in two color schemes for us scooterists. Wait! What was that? Off in the distance . . . Oh wow. I can already hear the sewing machines of scooterists taking off. Especially those of us who may want to decorate a little girl’s room in pink AND scooters. SuperBuzzy is (what else with a name like SuperBuzzy?) an adorable site with Japanese inspired fabrics and notions. 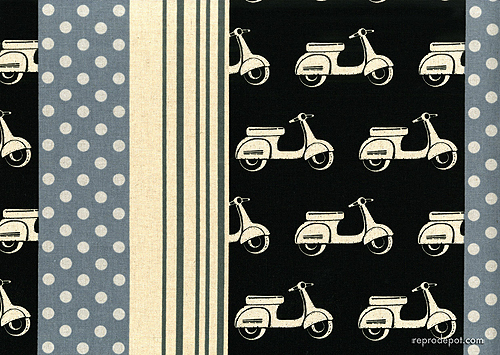 At RetroDepot the magenta and black scooter fabric sells in half-yards (18″) for $9.95. At Superbuzzy, all four colors sell in yards for $19.95. This entry was posted in Crafts, Fabric by Tracy. Bookmark the permalink. I hate the sneaky price per 1/2 yard deal at repro depot! so sneaky! Hey there! This is Djerba, the owner of Reprodepot. I just wanted to clarify why we have the half yard pricing. Unfortunately the shopping cart we use (Yahoo Store) only allows whole number increments (1,2,3,etc.) The only way we could offer half yards was to price and sell them in half yard increments. We had so many requests to offer our more expensive fabrics by the half yard and unfortunately it was the only way we could do it. I am sorry if it seemed like we were trying to be sneaky and fool our customers. Thanks for giving me the opportunity to clear all of this up! Awesome fabric. I want to make pillows for my retro sofa. 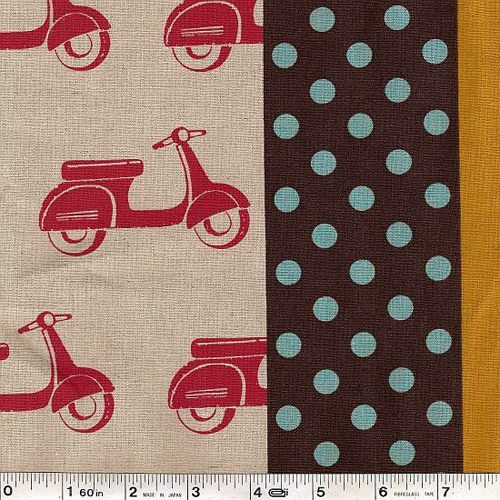 Maybe even a shopping bag just for my Vespa. Thanks! Pingback: Scooter Swag » Babies and Scooter Do Mix! 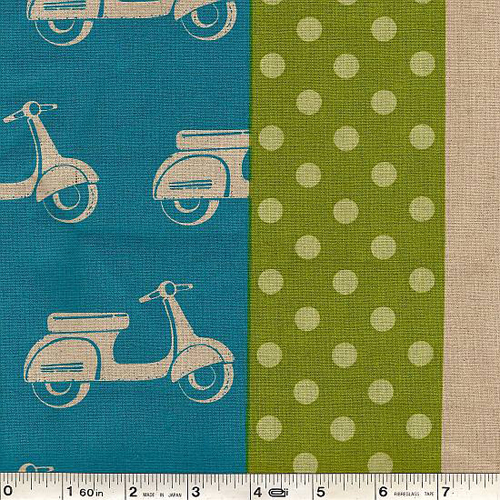 I would like to buy some of the scooter fabric in the blue red and green! Please contact me and tell me if I buy it from you? Unfortunately we’re not an online store but a blog, so we don’t actually sell any of the things we post about. This post is from 2008, so it will be hard to find this fabric now, especially as ReproDepot.com appears to be on hiatus. But you can always set up a eBay “Saved Search” or a Google Alert for “Echino Scooters Fabric” or “Scooters Fabric Quilting” and you will probably find it. Good luck!